On 13 December 1939 HMS Exeter, accompanied by the Leander class cruisers HMS Achilles and HMS Ajax sighted and attacked the pocket battleship Admiral Graf Spee in the South Atlantic. The German ship could have left the scene at speed, but her commander, Captain Langsdorff, made his fateful decision to stay and fight. 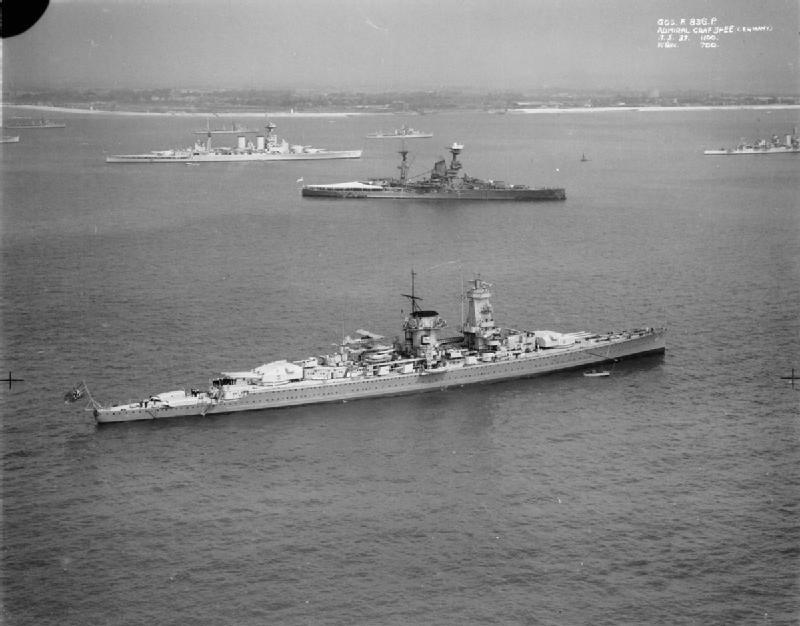 Admiral Graf Spee, pictured at Spithead in 1937, with HMS Hood and HMS Resolution. Once they had reached port the wounded were taken to hospital and the Allied prisoners on board were released. British naval intelligence then launched a propaganda campaign that convinced Langsdorff that a small armada was gathering to attack his ship the moment it left port. In fact, the nearest heavy ships were the aircraft carrier HMS Ark Royal and battlecruiser HMS Renown over 2,500 nautical miles away. International law regarding neutrality only allowed Langsdorff 72 hours in port before his ship would be interned, which was nowhere near the two weeks that he felt he needed to complete his repairs. Believing his fate to be hopeless, and after discussions with Berlin, Langsdorff decided to scuttle his ship.